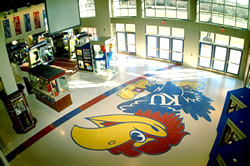 The Central States Terrazzo Association is comprised of an established group of contractors serving America’s Midwest region. All members of the CSTA are also members of the National Terrazzo & Mosaic Association, and uphold the quality standards set forth by the NTMA. The mission of the CSTA is to provide architects, designers, and specifiers in their local region with technical information, continuing education, and other resources to assist in specifying terrazzo in their projects. Terrazzo is a cementitious or resinous flooring system in which a binding agent (cement or epoxy) is mixed with aggregate (marble, glass, synthetic, or other chips), poured in place, then ground and polished. The end result is a beautiful, seamless, nonporous floor that will typically last the life of the structure. The design possibilities of terrazzo are endless… from the inexhaustible color palette to the ability to fulfill complex designs and logos, terrazzo is limited only by the imagination. In addition to its design flexibility, terrazzo contributes to a “healthy building.” Both cement and epoxy systems are composed of zero volatile organic compounds, and exhibit little or no off-gassing over the life of the cured floor. Additionally, terrazzo is a nonporous floor that does not support microbial growth, helping to maintain a mold-free environment and contributing to improved indoor air quality. This flooring does not need to be cleaned with harsh chemicals – a damp mop or environmentally-friendly cleaner is all that is necessary. Terrazzo has many green attributes and can contribute up to five LEED-NC v.2.2 points to a building project. Terrazzo is the most sustainable flooring system available. 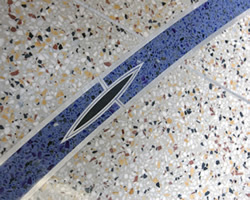 Terrazzo floors have a rich history of durability and performance dating back over a thousand years. In many cases, centuries-old terrazzo can be restored to its original luster at a fraction of the cost of replacing the floor finish.